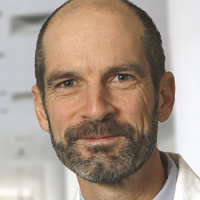 This is the eighth in a series of posts made in preparation for a presentation I will be making for physicians in fellowship training at an upcoming ACCP meeting. In the last post, I discussed how to invest your post-tax money for optimal returns in retirement. In this post, we’ll look at whether it is better to pay your student loans off early or invest in retirement. First, let’s just get this out of the way, if you have the option, the best way to manage your student loans is to get someone else to pay for them. There are a few ways of getting your student loans paid off. If you are pursuing a career in medical research, there are NIH loan repayment programs that will pay up to $35,000 a year on your loans. There are loan repayment programs if you join the military or if you agree to practice in certain underserved parts of the country. Lastly, when you get your first job out of residency, ask if the hospital or group practice will pay off some of your loans – most won’t but some will (particularly if they’ve been having a hard time recruiting into the position) and the only way to find out is to ask. The average medical student graduates from a public medical school with $172,751 in loans and from a private medical school with $193,483 in loans. That is a lot of debt for a resident making $50,000-$55,000 a year. If you can’t get someone else to pay off your loan, then you’ll be making monthly payments for a long, long time. The jump in annual income from being a resident to being an attending physician can seem like a lot, and it is, but it comes with a rapid ramp-up in the loan repayment requirements. Plus, as a medical student and resident, you may have been driving your grandmother’s hand-me-down 1998 Honda Civic and living in a one-bedroom apartment… you’re 30+ years old and you’re ready for a lifestyle upgrade. So, it is easy to find yourself spending all of that new income on stuff and not on your future retirement. Above all, do not get behind in your regular student loan payments. The cost in penalties is just too high and you’ll just fall further and further behind. So, we’ll assume that you are making your regular monthly payments on your student loans and then you have to decide if it is better to make a few extra payments on your loans or if it is better to put some extra money into a tax-deferred retirement plan? You have $150,000 in student loans. You probably have more than this but it is an easy number to use as an example. The average interest rate on your loans is 6%. You have a 15-year repayment period for your loans. This will equate to $15,316 of payments per year ($1,276 per month) of which about $9,000 per year is interest. You can deduct up to $2,500 of annual interest payments off of your income tax each year. Your tax deferred 401(k)/403(b)/457 has an 8% annual return on investment. Your taxable income is $258,000 ($255,500 after the loan interest deduction). You are married and filing jointly. We’ll use 2015 income tax and capital gains tax rates. We’ll compound interest monthly on the loan and we’ll compound capital gains monthly on the tax-deferred retirement account. You are financially responsible and you project that this year, you will have $20,000 in pre-tax income that you can use to either (1) put in your tax-deferred retirement account or (2) pay income taxes now on the $20,000 and use it to make extra payments on your student loans. 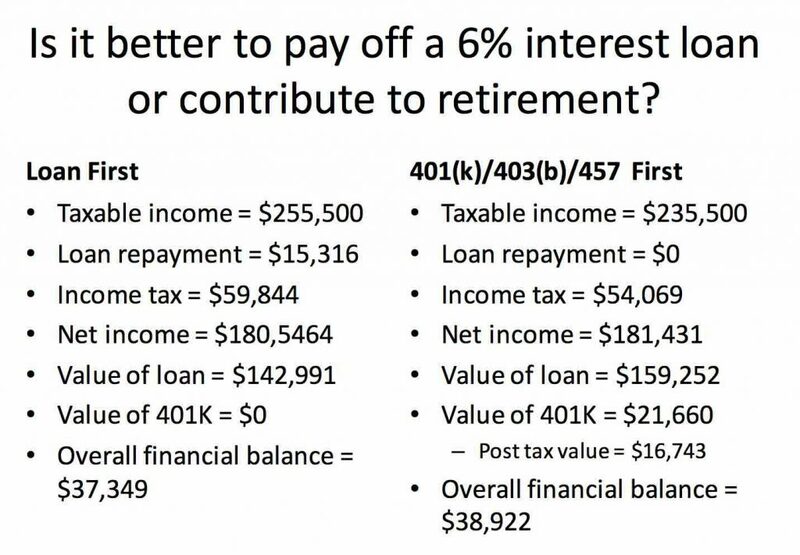 Now let’s take a look at what your financial picture will look like if you make extra payments on the loans versus if you invest the money into a tax-deferred retirement account. The first thing to notice is that with either choice, your taxable income drops to $255,500 because you can deduct $2,500 of your $9,000 in interest payments off of your taxable income for that year. The $20,000 in pre-tax money that you decide to use for extra payments for your student loan becomes $15,3116 after you pay an effective income tax rate of 23.42%. On the other hand, if you put the money into a tax-deferred retirement account, then after 1 year, that $20,000 becomes $21,660 and the value of that money if you were to retire after a year at your current effective income tax rate would be $16,743. Next, look at your overall financial picture at the end of the year if you make extra payments on your student loans. We’ll define the overall financial picture as your total assets (salary that year + the projected value of your tax-deferred retirement fund [after you pay taxes on it when withdrawing it in retirement] minus your debts (the balance remaining on your student loan). In this scenario, your effective income tax rate will be 23.42% and your overall financial picture will be $37,349. 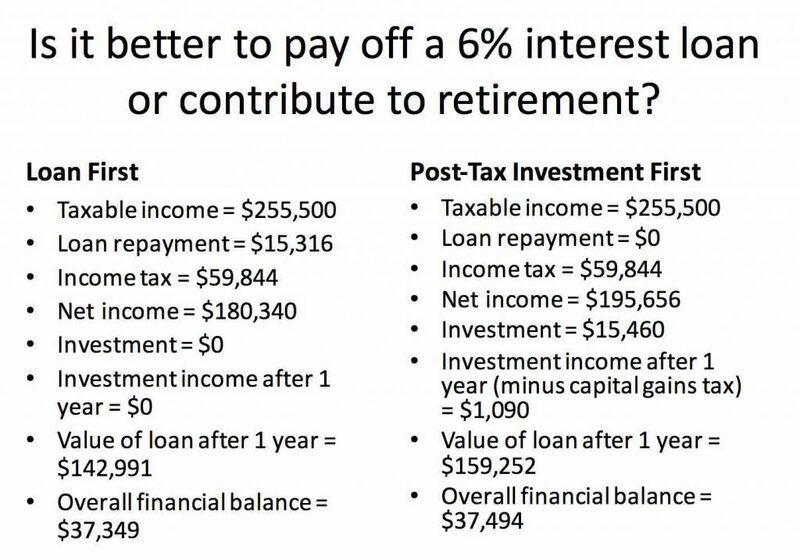 If, on the other hand, you decide to put money into a tax-deferred retirement account, your effective tax rate will drop to 22.70% and your overall financial picture will be $38,922. In other words, you come out ahead $1,573 by putting that $20,000 in a tax-deferred retirement account as opposed to making early payments on your student loans. Note that the value of the loan changes due to the effect of the higher interest. If you make extra payments on the student loan, your overall financial balance is $35,920 whereas if you put the extra money in a tax-deferred retirement account, your financial balance is $37,330. 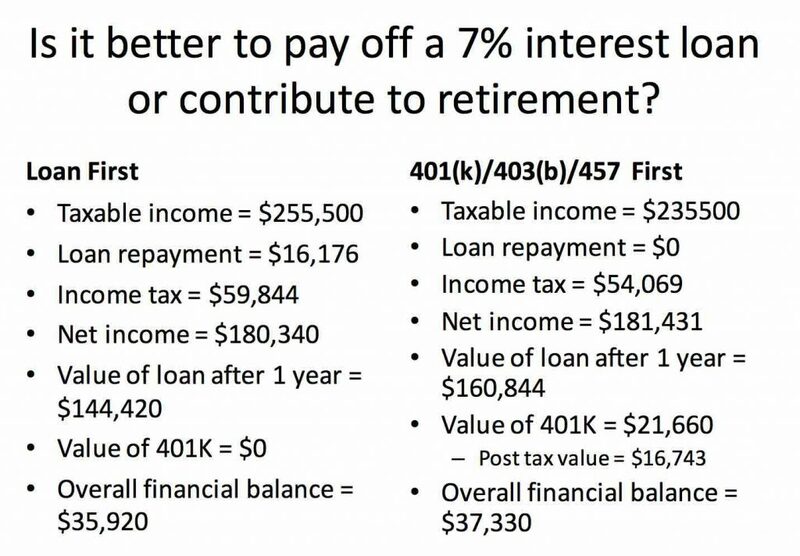 In other words, you come out $1,410 ahead by putting the money in a tax-deferred account. 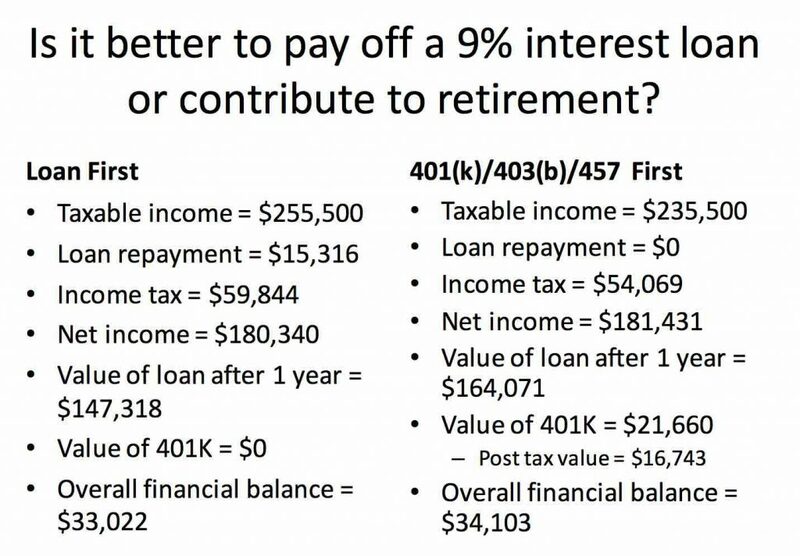 Now, your overall financial balance will be $33,022 if you make extra payments on your student loans versus $34,103 if you put the money into a tax-deferred retirement account for a net advantage of $1,081 to put the money in the retirement account. The bottom line is that you always come out ahead by putting the money into a tax-deferred retirement account instead of making extra payments on your student loan. Finally, let’s assume that you do not have the flexibility to put money into a 401(k), 403(b), or a 457. Should you put money into a regular investment after you have already paid income tax on that money? If the student loan is 6% then you come out only $145 ahead by investing the money (for all practical purposes, break-even). If your student loan is 7% (analysis not show), you come out only about $18 ahead by making an extra payment on the student loan (also, essentially break-even). If your student loan is 9% (analysis not shown), you come out $1,428 ahead by making the extra payment on the student loan. In other words, unlike the situation with a tax-deferred retirement fund where you always come out ahead by investing in your retirement fund, the situation with a regular investment funded out of your post-tax dollars is more complicated. If your student loan interest rate is high, then you are better off making extra payments on the loan and if the student loan interest rate is lower, it doesn’t make a lot of difference which choice you make. Every physician’s situation is a little different and you have to take into account the nuances of your own particular circumstances in deciding whether to put additional money into your retirement account versus make additional payments on your student loans. What is not taken into account in the above analysis is the peace of mind that you get when your student loans are finally paid off and from my own past experience that peace of mind is priceless. In the next post, we’ll take a look at options for investing in your children’s college expenses.